These days we are seeing Sonam kapoor trying many new designers, while her promotion schedule for Raanjhnaa; her upcoming movie releasing this week. Today we spotted Sonam Kapoor wearing Anupamaa Dayal Saree. This one is a beautiful Rose pink bengal handloom sari with a gold border. The parrot green pallu in this saree is hand printed with roses. She completed her look with stunning dull earrings (Amrapali jewels). Check it out. Did you liked her Look? 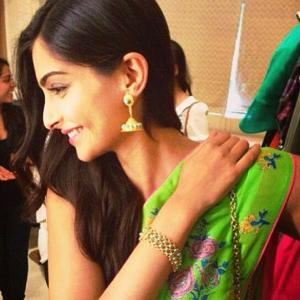 Well we totally love this simple yet elegant look of Sonam Kapoor, especially trying on this Parrot Green Saree mixed with Rose Pink color. Very natural yet stylish, isn’t it? Let us know your views through comments! !